For the past five years, I've been unreasonably excited about a metadata standard known as Open Badges. In October 2016, as part of Mozilla Foundation's plans to transition the maintenance of the standard to the non-profit IMS Global Consortium, the Open Badges website was relaunched with perhaps the most concise definition I've seen: "Connected, verifiable credentials represented in portable image files." 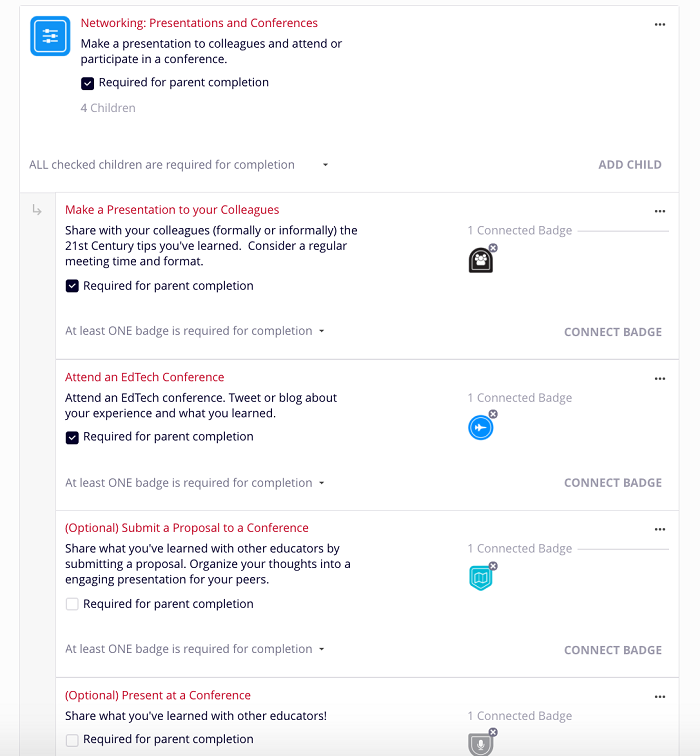 We're now at the stage where additional standards are being built upon Open Badges, whether blockchain-related or, as I will outline in this article, relating to ways badges tell stories through learning pathways. Whereas CVs and resumes are mostly claims about what you know and can do, Open Badges offer actual evidence. Like many open source projects, the value of this particular metadata standard is not only what it actually is, but what it signifies. There's been a shift in perception over the last decade around the value of "chunky" credentials such as high school diplomas and degrees. These days, employers are interested in more than the mere acquisition of knowledge and skills. They're interested in what you can do with them. Whereas CVs and resumes are mostly claims about what you know and can do, Open Badges offer actual evidence. I no longer need to take on faith the fact that someone is an excellent public speaker or can build a brick wall to a high standard—with badges I can see them do it. The evidence, which can be anything you can put on the web, from a video to a transcript, is "baked into" the badge as part of the metadata standard. In addition to hard skills, there are also behaviors and dispositions that are crucial to the success of any enterprise. Let's say you were going on an expedition. Of course, you'd want people who could read maps and who knew first aid, but you'd also want people who you could get along with and who wouldn't cause friction within the group. In organizational settings, we usually call this ability to get along with others the "soft skills" required to get the job done. For example, we need employees and colleagues who are punctual and who work well in a team. It turns out that badges are a great way to recognize and display behaviors and dispositions in a meaningful way. And, for those who have a way to go in learning how to collaborate well with others, badges set on a pathway allow you to frame the knowledge, skills, and behaviors that will help them "level up." The great thing about Open Badges is that they allow learning to be captured wherever and whenever it happens. In the true spirit of openness, anyone can issue a badge for anything. It could be Harvard University or it could be the leader of an after-school club. The value of a badge comes from the intersection of the prominence and gravitas of the issuing authority, on the one hand, and the perceived rigor of the criteria contained in the badge's metadata, on the other. For example, as often happens with regular qualifications in hiring, you may never have heard of the organization who issued an individual's badges, but you can dig into the badge metadata to see whether these badges were worth achieving. Four years since the Open Badges metadata standard hit version 1.0, large universities, major employers, and professional bodies are all using badges to encourage and recognize the kinds of knowledge, skills, and behaviors they want to promote. 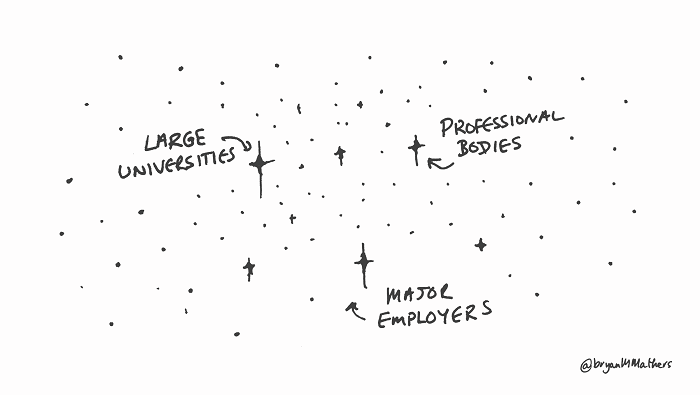 If these are the "bright stars" in the Open Badges sky, just as important are the smaller, dimmer stars that make up the flourishing ecosystem. We need these badges from local businesses, clubs, and organizations to give local value and color, but how do we link all these together? How can we show the value of the smaller, more nuanced badges alongside the big, showstopper badges? Up until now, industries have given much emphasis to the "supply side" of Open Badges—on creating and issuing them. As things stand, badge earners can share either individual badges or "collections" of badges. For those inspecting badges, discovering what an individual might be working towards is difficult—a large chunk of contextual value is missing. What's missing is a way to explain to those who are looking at your badges (admissions officers, employers, interested parties) how they link together. In other words: What's the story here? At the moment, we're treating Open Badges in a similar way as traditional credentials, placing value solely on the destination rather than on an individual's current journey. A single, big, showstopper badge shouldn't necessarily trump a badge pathway showing a relevant trajectory. We should recognize that traditional credentials recognize activity that occurs on a very uneven playing field. Some people, for various reasons, have had a relatively smooth path to where they currently stand. Others, with less-prestigious traditional credentials, may be a better fit but do not come from such a privileged background. This year will see several innovations that will change the ways individuals can show and prove the real-world value of their badges. After all, gaining an MBA from a well-known institution may look good on paper, but what does that mean in practice? Some of this innovation may come through adding badges to well-established tools such as e-portfolios. Some may come through marrying Open Badges to exciting new developments, such as around "blockchain" technology. But perhaps the most interesting new development, as hinted at already, is the emergence of a new metadata standard for learning pathways called Open Pathways. The organization behind this new metadata standard and data model is Concentric Sky, a software development company well known for developing the open source platform Badgr. For institutions and organizations issuing badges, the Open Pathways standard provides a way to gain feedback as to whether the credentials they provide are useful to learners in the marketplace. It can very clearly link either academic or vocational learning to outcomes outside the walls of the institution or organization. For example, an organization issuing badges would be able to state proudly that a certain percentage of people who followed a badged pathway ended up in employment. At a time when learning programs are increasingly under pressure to demonstrate impact, this is highly valuable. Employers, meanwhile, have the potential to discover much more suitable applicants to positions they seek to fill by inspecting the data produced by the Open Pathways standard. For example, based on opt-in data, they could gain information about individuals currently following pathways related to their sector. Predictive analytics could identify hot talent towards the beginning of their learning journey, allowing employers to provide support in return for first refusal on their labor once they are qualified. One of the biggest benefits of badge-based Open Pathways for earners is an increased "line of sight" into the job market. In addition, individuals can discover which badges are worthwhile in terms of their desired location. For example, if there is data to show that those who have completed one pathway are more likely to be employed six months later than those who have completed another, this may prove useful for those looking for a quick way to enter a new sector. For all three groups, badge issuers, earners, and employers, Open Pathways coupled with Open Badges have the potential to turn recruitment on its head. Eventually, we may see the end of the traditional resume or CV. 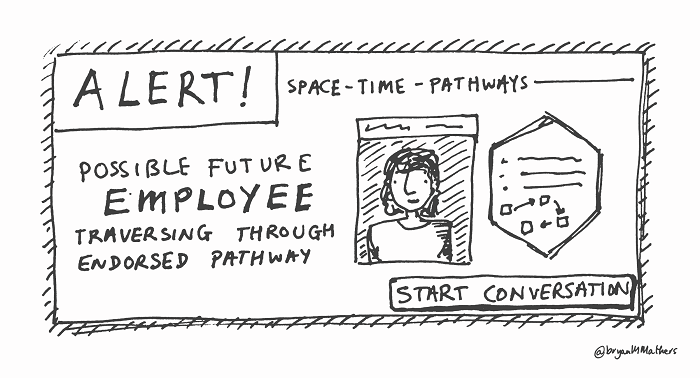 In the meantime, learners could generate these on-the-fly based on their public badges and pathways. Although Open Badges has gone (relatively) mainstream, the "chicken or the egg" problem still exists. On the one hand, employers are receptive to the idea of using badges and say that they will support them. On the other hand, applicants say they will care about badges when employers start asking for them. The new Open Pathways standard and approach should help to bridge that gap because badges will be more than just a new way of recording credentials. With Open Pathways, the holistic picture of individuals provided through Open Badges becomes less of a snapshot and more of a story. The new Open Pathways standard is set to be adopted across the Open Badges landscape in 2017. Right now, it's available in Concentric Sky's open source platform Badgr. It provides a way for organizations to work towards the knowledge, skills, and behaviors they want to promote, and allows individuals to tell a more holistic story about who they are and what they can do. Open standards are the foundation of the web. They're the reason you can visit almost any website in any modern browser and everything just works. Similarly, the Open Badges ecosystem has flourished because this new learning currency, this new way of doing credentialing, is built on an open standard that anyone can use. The success of the Open Pathways standard depends on it being widely adopted and used by people and organizations. If you're a badge-issuing platform, why not consider adopting this new standard? If you're a badge issuer, why not ask your chosen provider to look into integrating Open Pathways into its product? Badges are a great way of painting a more holistic picture of who we are and what we can do. With Open Pathways, this becomes a story, set in a rich context. I'm looking forward to a world, perhaps a year or 18 months from now, where the major badge-issuing platforms, due to their adoption of open standards, have grown into interoperable "journey keepers" for individuals. Doug Belshaw - I'm a consultant who helps people and organisations become more productive in their use of technology. With We Are Open Co-op, I work with my co-founders to spread the culture, processes, and benefits of open wherever we can. This sounds like something to be gamed. yep, that's the new trend. Gamify everything. And I'm ok with that lol. Gamification is a form of behavioral psychology, so I see it as a minus. But if microcredentialism/badges can lighten the salespersonship burden of convincing employers to take a chance on a person, the behavioral baggage may be a worthwhile price to pay. My biggest fear is a structurally less labor intensive economy. That, combined with gamification of the workplace, is basically the basis to the short novel Manna by Marshall Brain. No mention of microcredentials there, but heavy use of microtasking, which is a closely related concept. The microcredentials boosters really need to distance themselves from microtasking to have my support.